Our live surgery courses, hands-on sinus augmentation, grafting, dental implant surgical and restorative participation courses will be offered in a state-of-the-art dental facility located in Tijuana. Our programs start off in San Diego, California on a Thursday afternoon. We will have lectures in San Diego at a local hotel and then we will transport everyone and their luggage across the border in a large van. 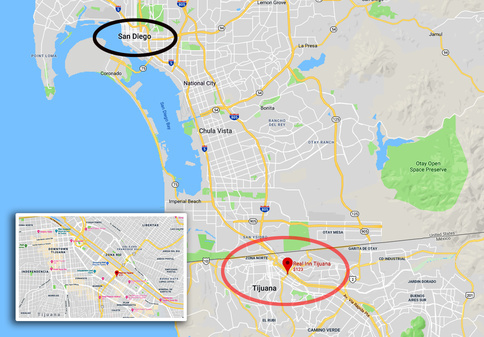 The REAL INN Tijuana is where we will stay, and have additional presentations before heading off to the clinic where the live surgery procedures will be done under supervision of our expert faculty and local staff. All participants will be staying at the REAL INN Tijuana. All accommodations are included in the tuition for this program, including transportation to and from the clinic and hotel via van. Note: All participants are required to have a current passport. Please do NOT forget to bring a passport for travel into and out of Mexico.